We’re back with another upcoming table ninja tip that finally puts a Huawei tablet on the T-Mobile network after so many months of rumors. We’re hearing that a T-Mobile variant of the current Huawei Mediapad is coming to T-Mobile the first week of November and as our ninja put it, it’s a “high end” version for Magenta. So how high end? Well the specs won’t blow your socks off but a 7″ IPS WVGA 1280×800 touchscreen paired with a 1.2 GHZ dual-core processor, Android 3.2 Honeycomb, Flash 10.3 preinstalled, 16GB of built-in storage, dual cameras and even a 4100mAh battery. We can chalk this up firmly in the rumor category until we hear something more concrete but with rumors of a Huawei tablet arriving on T-Mobile existing for months we wouldn’t be surprised to see this one come true. 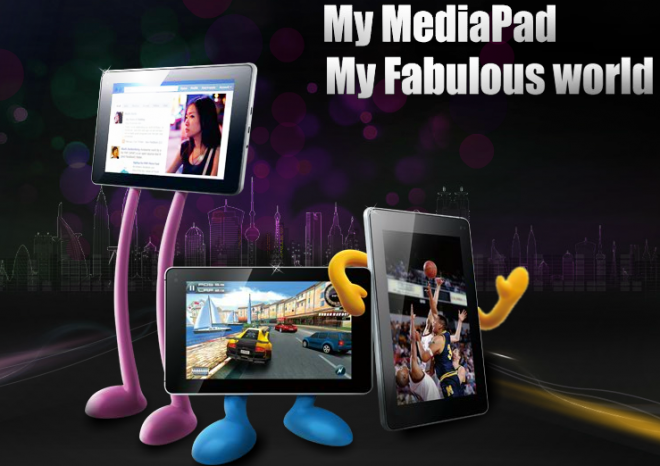 See the Mediapad as it exists now on the Huawei website. ← T-Mobile Didn’t Show Galaxy S II Device Because Of Processor Changes? Ok, I want the one with long legs. I believe it has a 1024×600 screen rez. If the T-Mobile model does have a 1280×800 rez then that would indeed make it high end. Been intrested in this tablet since it was announced. Will give it a hard look. Absolutely garbage website and a device that hardly looks to deliver anything special. It’s only recently that I’ve began to hear of this Huawei brand but it’s already clear to me that it’s Chinese crap. I agree, the flash on the site is terrible. People tend to judge a company by it’s cover, in this case….the website. The specs are accurate. The screen is higher resolution than iPad 2. Higher PPI. It has better resolution lg optumus pad tmobile has that’s good . I like pretty much everything about it except for the reported “6 hours working time” for the battery. Why, when Samsung just announced a slew of devices that put everything else (just about) to shame? !